When Megan, Greg, and Michael arrived in the courtroom they were wearing tan prison jumpsuits marked “FEDERAL INMATE,” with their hands shackled to their waists. We sang to them, “Sacred the Land, Sacred the Water.” Francis Lloyd noted that Megan had begun to suffer from the cold, and got permission from the judge to lend her his jacket. Outside, Paul Magno and Ellen Barfield briefly summarized the morning’s events for the press then introduced them to a range of eloquent speakers: Clare Grady to talk about the role of resistance in contributing to the evolution of law, and Father Bix, Chrissy Kirchhoefer, and Jim Haber to speak about the action in the context of ongoing nuclear resistance nationwide. So today what we heard was a lengthy, lengthy examination of the law, and yet the supreme laws of our land were left out of the courtroom, left out of this trial. The Constitution, Article Six Section Two: “All treaties, pacts, and protocols that are signed and ratified become the supreme law of our land; every judge is to abide by them.” And those laws have evolved over the years to outlaw war of aggression; outlaw weapons of mass destruction; outlaw killing civilians; outlaw occupation; outlaw stealing the earth’s resources to build these weapons. We are not upholding those laws. Our friends in this courtroom have manifest the original law that is written on our hearts, the law to love one another. We all bring each other forward, help each other when we each manifest that law; then our human laws will start to reflect that as well. This is not just about Greg and Megan and Michael. It’s a collective that has offered us this by example, and then we offer each other this by example. This is a tag team, a relay race — whatever you want to call it, but it’s something that’s done in a collective, it’s not done alone. From A Pinch of Salt. Review on Y-12 before July breach: accomplishments were deemed to have an "exceeded level of high quality performance." We had a short phone conversation with Sister Megan Rice, and she pointed us to several websites about the Oakridge, TN Y-12 Facility, for instance here, about the cheating on security tests, and she said to check out this website too: Global Security Newswire. Before dawn on July 28, 2012, Michael R. Walli (63), Megan Rice shcj (82), and Greg Boertje-Obed (57) carried out a disarmament action at the Oak Ridge Y-12 nuclear facility. Calling themselves Transform Now Plowshares, they hammered on the cornerstone of the newly built Highly-Enriched Uranium Manufacturing Facility (HEUMF), splashed human blood and left four spray painted tags on the recent construction which read: Woe to the empire of blood; The fruit of justice is peace; Work for peace not for war; and Plowshares please Isaiah. Later that day, they were interviewed by the DOE investigative unit and given conditional charges of two felony counts for vandalism and trespass. They spoke to supporters from Blount County Jail at 12:30 pm saying they had not been processed yet. All are scheduled for arraignment in Blount County Court on Monday. Please send letters of support. RETURN ADDRES MUST HAVE FULL NAME AND FULL ADDRESS OR INMATE WILL NOT RECEIVE MAIL. Michael Walli, Megan Rice and Greg Boertje-Obed made their initial appearance before federal magistrate Bruce Guyton in Knoxville, Tennessee at 11:15am today—Monday, July 30, 2012. 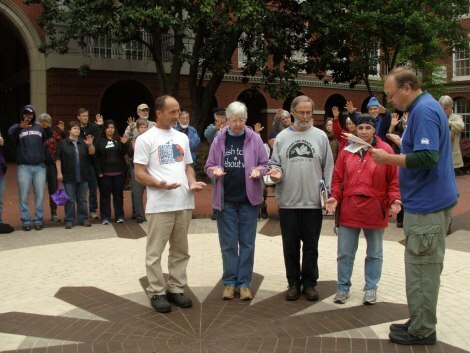 The proceedings were nearly over before Greg required the judge to read the charges against them—the trio were charged with criminal trespass, a misdemeanor, for their Transform Now Plowshares action on Saturday, July 28 at the Y12 Nuclear Weapons Complex in Oak Ridge, Tennessee. In court, the defendants were calm and composed. They spoke clearly, answering the judge’s questions directly. It was a pro forma hearing until the judge asked them each if they had a chance to review the complaint against them. The judge moved on to ask Megan Rice the same series of questions. When he got to “Have you had a chance to review and do you understand the charges contained in the document?” Megan answered, “It is incomprehensible that our charge against the activities at Y12 is not part of this conversation.” Megan referred to the indictment against Y12 the activists carried with them (and which was released after the action by supporters). The judge moved on to Greg, asking him if he understood the complaint. Greg, who was representing himself, said, “I thought you were going to ask me if I wanted the complaint read first.” The judge smiled and said, “You’re right, I should do that. You are representing yourself quite well.” Then he went on to ask Greg the question he had already put to Mike and Megan, who had waived the reading. Greg answered that he normally prefers to have the charges read publicly. It was only then the public heard the formal charge— “that you willfully and without authorization entered the National Nuclear Security Administration’s Y12 Complex…” The language of the charge mirrors the authorizing statute—the three were charged with simple trespass, a criminal misdemeanor charge punishable by a fine of up to $100,000 and a sentence of up to one year imprisonment and one additional year of post release supervision. No charges for destruction of property or defacing property were entered at the hearing, though they could come later. When the prosecutor, Melissa Kirby, listed reasons for denying bail to the defendants (they all waived their rights to a hearing), she noted they had “bragged about their action to the media,” and were flight risks, etc. Mike Walli noted for the judge that he had been released in 2010 and appeared “under my own steam as agreed,” for all hearings and the trial. Francis Lloyd noted the defendants had made no statements to the media that were not protected under the first amendment; Greg noted that Plowshares actions are carried out in obedience to Isaiah’s prophecy that swords shall be turned into plowshares, that Ms. Kirby was wrong to characterize Plowshares as “an organization,” and noted that in similar actions in other jurisdictions, judges had permitted testimony about international law and some juries have found defendants not guilty. RETURN ADDRESS MUST HAVE FULL NAME AND FULL ADDRESS OR INMATE WILL NOT RECEIVE MAIL. Our history with Blount County is pretty sketchy with regard to mail. The 2010 Y12 protestors were denied mail because “we don’t have the staff to screen the quantity of mail you are getting.” So we encourage mail, but be aware it may come back to a month later, unopened, at the whim of jail authorities. On February 8, a jury in Los Alamos, New Mexico, will hear the case against six people charged with trespass during a demonstration against expansion of the nuclear weapons production complex at Los Alamos National Laboratory. The August 6, 2010 demonstration involved over 120 people, led by Think Outside the Bomb youth at the conclusion of their ten-day Disarmament Summer encampment in nearby Chimayo. They observed the 65th anniversary of the atomic bombing of Hiroshima, Japan, with a spirited march through the town and up to the gate of the plutonium processing facility. Eight people joined a sit-in at the gatehouse for half an hour until they were taken into custody by Los Alamos police. They were cited and released the same day. Two later pled no contest, and were sentenced to fines and probation. 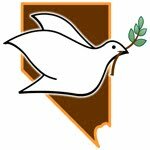 Defendants Jason Ahmadi, 25, and Jeff Freitas, 26, from California; Bryan Martin, 24, from Boise, Idaho; Lisa Fithian, 49, from Austin, Texas; and Sr. Megan Rice, 80, from Las Vegas, Nevada, will be represented by attorney Mary Lou Boelcke, while defendant Jack Cohen-Joppa, 54, from Tucson, Arizona, and will represent himself. Their trial is set to begin at 9:00 a.m., Tuesday, February 8, in the Los Alamos County courtroom of Magistrate Pat Casados, 2500 Trinity Drive, Los Alamos. Jury selection will begin at 8:00 a.m. Expert testimony about the Los Alamos National Laboratory and the proposed expansion of the plutonium pit facility is expected to be heard from Jay Coghlan of Nuclear Watch of New Mexico, and Greg Mello of the Los Alamos Study Group. The recent passage of the START Treaty has created an illusion about disarmament. The Obama Administrations is seeking $180 billion + to rebuild the nation’s nuclear weapons production capacity and delivery systems. Opposition to the Obama administration’s plan is growing and resulted in arrests last year at the three major factory sites in Oak Ridge, Tennessee; Kansas City, Missouri; and Los Alamos. The February 8 trial in Los Alamos will be the first of these cases heard by a jury. Fines, probation and short jail sentences resulted from state trials in Missouri and Tennessee, while thirteen people still await trial May 9 in federal court in Knoxville, Tennessee, after crossing the line at Oak Ridge last July 5. 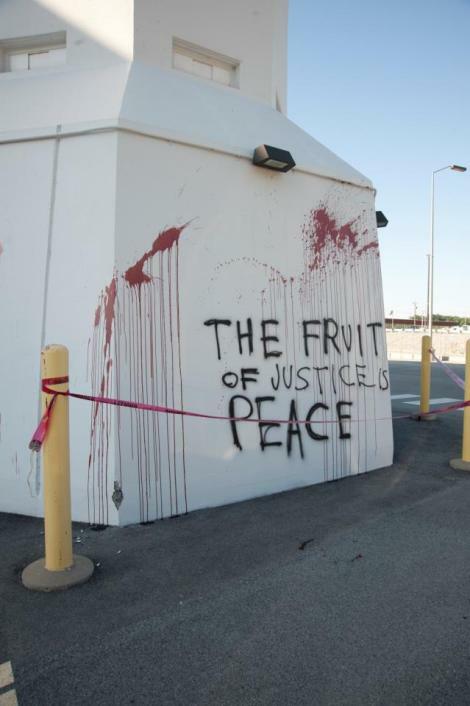 On August 6, 2010, the 65th Anniversary of the bombing of Hiroshima, eight people were arrested blocking the gate to the plutonium pit production facility at Los Alamos Nuclear Laboratory, following a demonstration against the expansion of the nuclear weapons complex. Six of us will face a jury trial on February 8 in Los Alamos, New Mexico. We could use your support. We are asking for donations from both individuals and groups – even $6 – one dollar for each of us will be a big help! Your contribution will support educational work around the trial, expenses for the volunteer expert witnesses and our pro bono attorney. Take a stand with us against new nuclear weapons production and help protect our right to do it. Contributions can be made payable to TOTB and mailed to Think Outside the Bomb, c/o Lisa Putkey, POB 508, Chimayo, NM 87522. On Thursday, November 18, Fr. Louie Vitale and Sr. Megan Rice were convicted of “trespass” in Santa Barbara Federal Court for their August 23 witness against the Minuteman III launch. Fr. Louie received a $1,000 fine and Sr. Megan received a $500 fine. Neither received jail time or probation from U.S. Magistrate Rita Coyne-Federman.